A U.S. soldier deployed to Iraq has been honored for helping foil a plot to bomb a school in Denmark. Capt. Bradley Grimm received the Danish Defense Medal for Special Meritorious Effort, said Col. Steve Warren, a spokesman for Combined Joint Task Force Operation Inherent Resolve. Grimm provided "actionable intelligence" about a bomb threat against a school in Denmark, Warren said this week during a briefing with reporters. "The information he provided helped to foil a plot and resulted in an arrest and a confiscation of explosives," he said. "Brad's work likely saved the lives of Danish citizens." 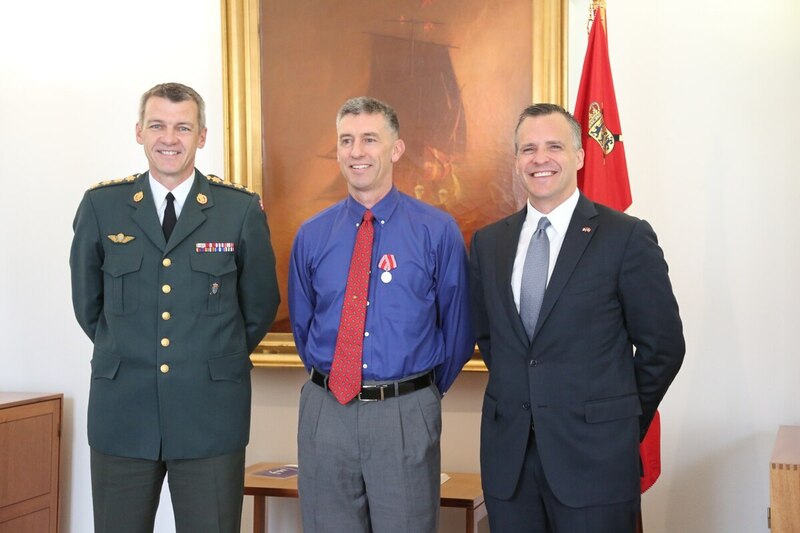 Danish leaders also recently honored five Marines for their "outstanding contributions to the Danish forces during operations in Iraq," according to information on the Embassy of Denmark website. Four Marine majors — Michael Radynsky, Justin Jones, Richard Schellhass and Scott Benninghoff — received the Defense Medal for Exceptionally Meritorious International Service. Chief Warrant Officer 4 Jake Geary received the Defense Medal for Exceptionally Meritorious Service. The Marines were honored April 13; Gen. Peter Bartram, Denmark's chief of defense, presented the awards. Gen. Peter Bartram, Denmark's chief of defense, presented decorations to five Marines, Majs. Michael Radynsky, Justin Jones, Richard R. Schellhass, and Scott Benninghoff, and Chief Warrant Officer 4 Jake Geary, for their support to Danish forces in Iraq. These honors came as the Danish Parliament voted to expand that nation's role in the fight against the Islamic State group. Defense Secretary Ash Carter called the decision "a welcome contribution from a valued partner" and "another sign of the growing momentum for the campaign to defeat ISIL." Denmark's contributions to the effort already include strike aircraft, air defense radar, and training and assistance to Iraqi forces, Carter said in a statement. "This renewed and expanded role in the military campaign, including the authority to participate in the full spectrum of combat operations in Iraq and Syria, will further increase the military pressure on ISIL," Carter said. Grimm, who is based at Iraq's al Asad Airbase while deployed, helped develop a system to "speed the flow of intelligence" from the ground to senior leaders, Warren said. He also gleaned valuable intelligence from "exploited captured documents on enemy foreign fighters who were from Denmark or who had relatives in Denmark, as well as some cyber information on possible terrorist threats to Denmark," Warren said. Grimm's work uncovered information on a bomb threat, using homemade explosives, against the Danish school. "It's not every day an American captain receives a very high, prestigious medal from a foreign country," Warren said. Grimm's work also sends a message about how seriously the military takes the threat of external operations, Warren said. "As we conduct operations, as we partner with our Iraqi partners, we are continuously with them to try and draw out any tidbit of information that we can find that relates in any way to an external attack or an external operation that ISIL is planning," he said.